310 pages | 148 B/W Illus. Geographic Information Systems (GIS) provide essential disaster management decision support and analytical capabilities. As such, homeland security professionals would greatly benefit from an interdisciplinary understanding of GIS and how GIS relates to disaster management, policy, and practice. Assuming no prior knowledge in GIS and/or disaster management, Geographic Information Systems (GIS) for Disaster Management guides readers through the basics of GIS as it applies to disaster management practice. Using a hands-on approach grounded in relevant GIS and disaster management theory and practice, this textbook provides coverage of the basics of GIS. It examines what GIS can and can’t do, GIS data formats (vector, raster, imagery), and basic GIS functions, including analysis, map production/cartography, and data modeling. It presents a series of real-life case studies that illustrate the GIS concepts discussed in each chapter. These case studies supply readers with an understanding of the applicability of GIS to the full disaster management cycle. Providing equal treatment to each disaster management cycle phase, the book supplies disaster management practitioners and students with coverage of the latest developments in GIS for disaster management and emerging trends. It takes a learning-by-examples approach to help readers apply what they have learned from the examples and disaster management scenarios to their specific situations. 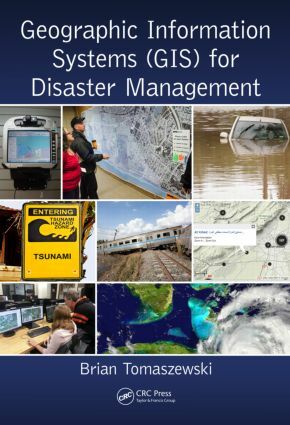 The book illustrates how GIS technology can help disaster management professionals, public policy makers, and decision-makers at the town, county, state, federal, and international levels. Offering software-neutral best practices, this book is suitable for use in undergraduate- or graduate-level disaster management courses. Offering extensive career advice on GIS for disaster management from working professionals, the book also includes a GIS for disaster management research agenda and ideas for staying current in the field. What Can You Do (and Not Do) with GIS Software? Brian Tomaszewski PhD is a geographic information scientist with research interests in the domains of geographic information science and technology, geographic visualization, spatial thinking, and disaster management. His published research on geographic information systems (GIS) and disaster management related topics has appeared in top scientific journals and conferences such as Information Visualization, Computers, Environment and Urban Systems, Computers and Geosciences, the IEEE Conference on Visual Analytics Science and Technology, and The Cartographic Journal. He also regularly publishes in popular GIS trade magazines such as ArcUser and ArcNews. He also is also as a scientific committee member for the Information Systems for Crisis Response and Management (ISCRAM) conference. Dr. Tomaszewski'srelevant experience includes past work with internationally focused organizations interested in GIS and disaster management such as the United Nations Office for the Coordination for Humanitarian Affairs (UN-OCHA) ReliefWeb service, United Nations Office for Outer Space Affairs Platform for Space-Based Information for Disaster Management and Emergency Response (UN-SPIDER), and United Nations Global Pulse. He also served as a visiting research scientist with the United Nations Institute for Environment and Human Security (UNU-EHS) in Bonn, Germany. He mentored and instructed multidisciplinary GIS for disaster management student research groups via the National Science Foundation (NSF)-funded Science Master’s Program (SMP) titled Decision Support Technologies for Environmental Forecasting and Disaster Response at the Rochester Institute of Technology (RIT). His research on geospatial technology educational development and spatial thinking in Rwanda has been supported by the United Kingdom Department for International Development (UK-DFID) and he is actively involved in other funded computing research activities in Rwanda. Brian is currently an assistant professor in the Department of Information Sciences and Technologies at the Rochester Institute of Technology. He holds a PhD in geography from the Pennsylvania State University. For more information, visit: http://people.rit.edu/bmtski/.